Interesting little story I have to share about an old chandelier. I can't begin to tell you how much stuff I have at my house. I inherited a ton of stuff from my parents and grandmother. For those of you who have lost parents, it often hard to get rid of stuff you inherited. So, I've hung on to a lot of it; so much of it that I often forget what I have. I think I've mentioned before that as my pal, Jennie, and I go junking, I often see things and say "I think I have one of those" and Jennie replies, "of course you do." So, Jennie is redoing her master bath. She really needed to....let's just say there was golden color wallpaper and border that was, well, no nice way to say it, the color of, um, shhhh...pee (it came with the house). Jennie lives in a huge house in one of the nicest neighborhoods so the bathroom makeover was a must. She tells me she would love to find a vintage chandelier to hang over the bathtub. "I think I have one of those." It's amazing how you view things as a child. I remember going with my parents to an estate sale when I was a kid. They bought a chandelier. It hung in our formal living room (you know, the room nobody goes in). I remember it being huge, lots of crystals, gawdy. I remember it being so 70's (which is the decade we bought it from the estate sale.) Hey Jennie, you're welcome to use it but I don't think you'll like it. So we haul it down from our attic. but it's missing crystals and it is DIRTY, gross dirty. here are the crystals that have fallen off; yep, there supposed to be clear. we'll be able to throw it back in the attic. No way she'll want that. You know, it's really not that huge like I remember. What? She wants it? Is she crazy? Ok, you can have it. hangs each of those crystals back on. but you can see the pattern the chandelier creates on them. It cleaned up pretty well, don't you think? I'm linking up to a few special linky parties in my list above or down below on the right. Gorgeous! Her bathroom looks it deserves a post of it's own. wow!!!!! it looks perfect in her bathroom. the whole bathroom is stunning! Oh ma gosh it's beautiful! I love it! Looks a bit like my "70's" chandeliers that now hang in two rooms in my house, too. What a lovely chandelier and a great story! I love the chandelier - it cleaned up so well. What a smart idea to put the crystals in the dishwasher. Omaga....gorgeous! And perfect for that spot. She'll have a great story to tell when others come thru and see it :) And you'll always know where your inheritance ended up. You could go visit it once in awhile and maybe she'll let you soak in that amazing tub! What a gorgeous chandelier! 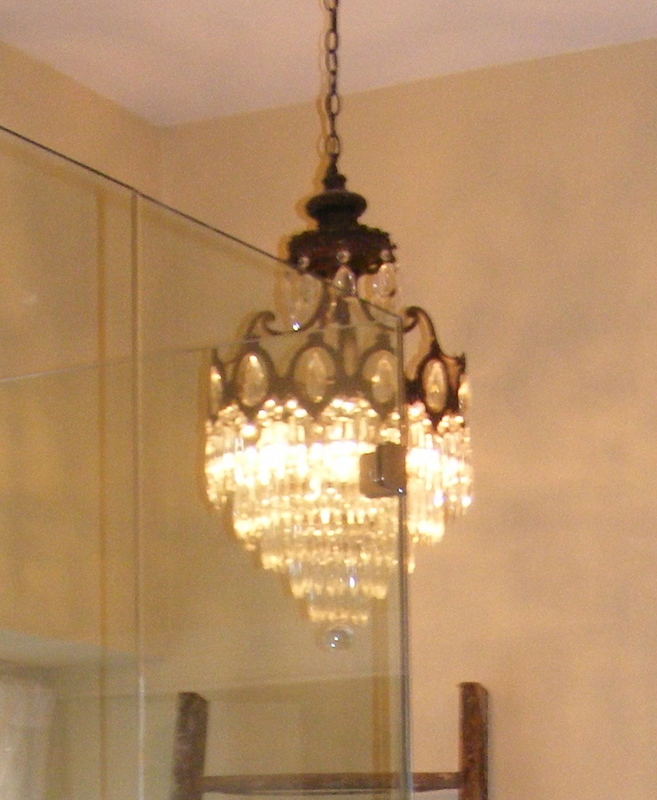 It looks perfect in your friend's bathroom, bet you wish that you had kept it! Positively stunning! What a sight as you soak in the tub! So envious. I can't believe you gave it away! Jennie is lucky to have a friend like you. 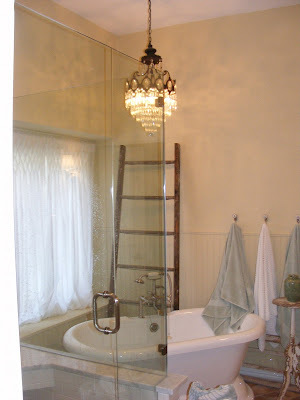 She did a great job cleaning that beauty up and enhancing it, now it is perfect in the bathroom with those high ceilings. Funny how perspective changes over the years, for sure! I love your new header photo! looks lovely like it was meant to be...Jeannie is a very lucky girl. You are a good friend and it looks fabulous! It's gorgeous! It's just perfect in her bathroom, too. That is beautiful! Can I be your friend and go through your attic too? It looks great! A little elbow grease goes a long way, doesn't it? That's gorgeous. And just the right size for a bathroom. I want to move into her bathroom. That tub looks so comfy! That's beautiful, it looks perfect in Jennie's new bath. Isn't it funny how we remember things? Now that was meant to be! It doesn't look like the same piece. Great transformation and gorgeous bathroom. Wow, I go away for a weekend. You get a new header! Love it. Chandelier greatness! Does she have to return it ever? She won't want to. That is gorgeous! You'd better go see what else is in the attic! beautiful. I love chandeliers in the bathroom. That must have cost a fortune in it's day. You are a good friend! I have the same situation. I see so many "vintage" items stored in my basement that I've inherited. My house would be bursting out the seams if I ever got around to doing something with all of it. I love the chandelier and that it's now a part of your friend's home. I'm sure she's in love with it as well as the fact that it's a gift from you. That's a great story. She did a beautiful job with it. love it. I found you on Funky Junk's link party. Isn't it great that your parent's chandelier ended up in such a pretty spot. Do you wish you hadn't given it away, now? Drop dead gorgeous! I love it! Absolutely gorgeous!! Wow.. what a recovery!! You are amazing!! So nice, glad you resurrected it!